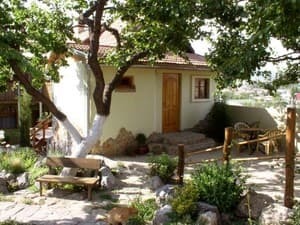 Mini-hotel "Sunny Castle" is located in the eastern part of Sudak, on the slope of Mount Fireynaya, a 15-minute walk from the waterfront and water park. No more time will take and walk to the market, amusement park. Near the hotel there is a shop, several cafes, parking. Free Wi-Fi is available in all areas and in the rooms. The hotel is in a quiet area of ​​the city. Guests of the "Solar Castle" have the opportunity to adhere to the usual diet. For this, there is a guest kitchen where you can cook a light breakfast, a homemade dinner or an exquisite dinner. For the curious visitors of Sudak local tour agencies have developed about 50 routes for every taste: pedestrian, auto-pedestrian, marine. Prices may vary, it is necessary to clarify the information with the operator. Description of the room: The Dutch room is a 1-2-bed economy room located on the 1st floor of the lower guest house. A bathroom is on the floor. The door of the room faces the patio. This is the coolest of the economy class rooms. The Dutch room is furnished with a chest of drawers, a mirror, a bedside table, two single beds that can be pushed together. If the Dutch room is rented for one person, its cost is reduced by 20%. 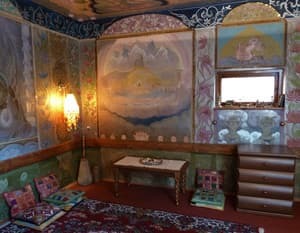 Description of the room: The Crimean room is a 1-2-bed economy room located on the 1st floor of the upper guest house. A bathroom is on the floor. The window of the room faces the garden. Connoisseurs of creativity M. Voloshin will please his watercolors decorating the walls of the room. The Crimean room is equipped with an exhaust fan. The room is furnished with a wardrobe, a bedside table, a mirror, a table, two single beds that can be pushed together. 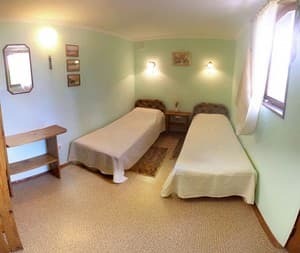 If the Crimean room is rented for one person, its cost is reduced by 20%. 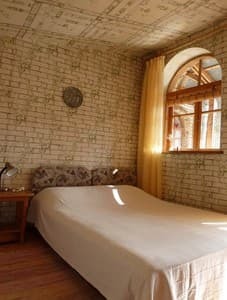 Description of the room: The Turkish room is a 1-2-bed economy room located on the 2nd floor of the upper guest house. Bathroom on the 1st floor. 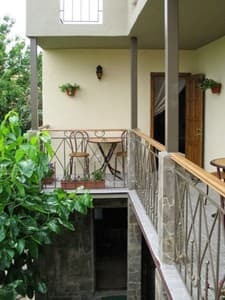 The room has a private balcony with a table with a picturesque view of the mountains and the garden. The room is furnished with a wardrobe, a bedside table, a mirror, a table, two single beds that can be pushed together. 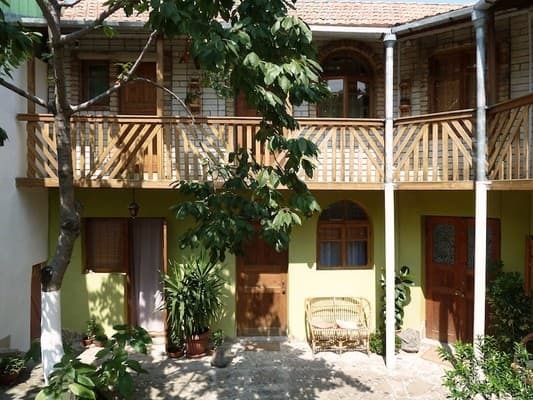 If the Turkish room is rented for one person, its cost is reduced by 20%. Description of the room: The French room is a 1-2-bed economy room located on the 2nd floor of the lower guest house. Bathroom on the 1st floor. The window of the room faces the garden. The room is furnished with a wardrobe, a mirror, a table, two single beds that can be pushed together. If the French room is rented for one person, its cost is reduced by 20%. Description of the room: Japanese room - 1-2-bed room with private facilities, located on the 1 st floor of the lower guest house. The windows overlook the patio. The room has a small hallway, shower, toilet, wall cupboard, chest of drawers, bedside table, 2 beds that can be pushed together. The equipment of the Japanese room is made up of air conditioning, refrigerator, LCD TV, DVD, kettle with crockery, hair dryer. 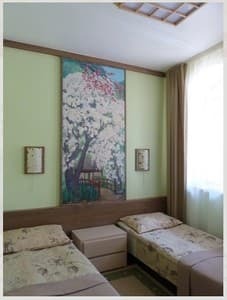 If the Japanese room is rented for one person, its cost is reduced by 20%. 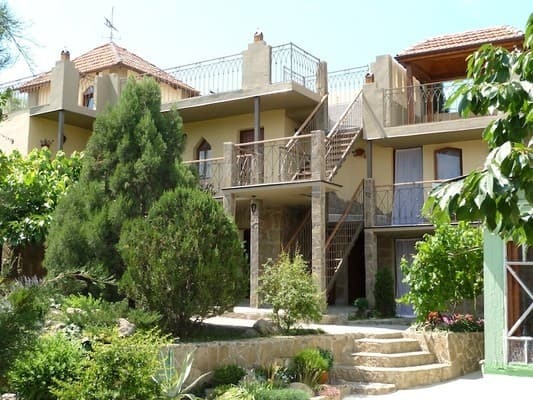 Description of the room: Greek house - 1-2-bed room with private facilities, with a separate entrance and a small entrance hall. The windows are facing the mountains, there is a table next to the porch. The room is furnished with a wardrobe, a bedside table, two single beds that can be pushed together. 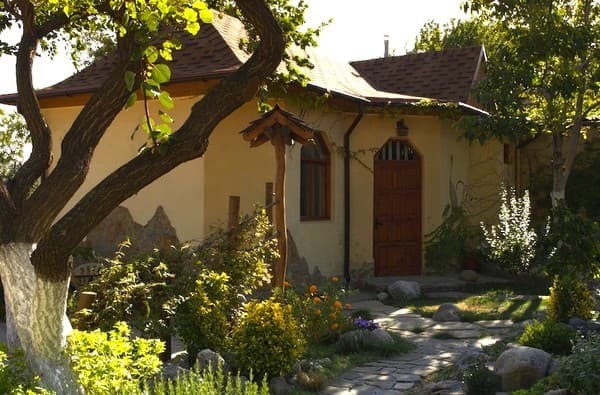 If the Greek house is rented for 1 person, its cost is reduced by 20%. 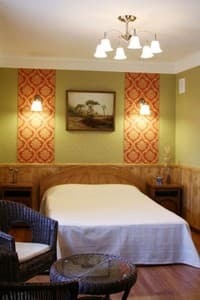 Description of the room: The English room is a 1-2-bed room with private facilities and an entrance hall, located on the second floor of the upper guest house. This room has a balcony with a table overlooking the mountains. The room has a wardrobe, chest of drawers, bedside tables, a table and chairs, a double bed. If the English room is rented for one person, its cost is reduced by 20%. 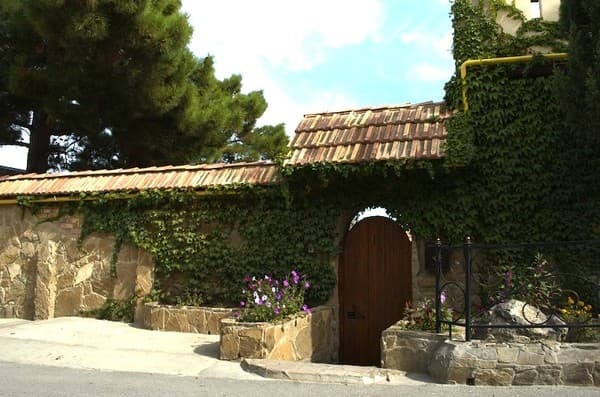 Description of the room: Alpine Lodge - 1-2-bed room with private facilities, with a separate entrance from the roof of the upper guest house. 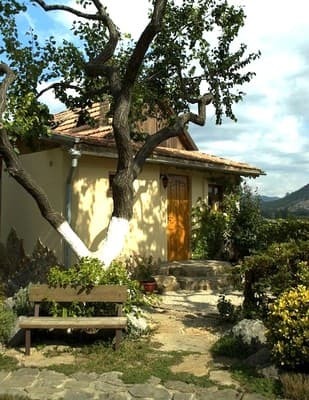 It has its own terrace with a table and a beautiful view of the Sudak valley, framed by mountain peaks. The furnishing of the house consists of a wall cabinet, chest of drawers, a bedside table, a bed table, two single beds that can be moved together. If the Alpine house is rented for one person, its cost is reduced by 20%. Description of the room: Indian room - 2-3-bed room with private facilities, located on the 1 st floor of the lower guest house. The windows overlook the patio. The room has a small hallway, wall cupboard, chest of drawers, shelves, table, 2 beds, sofa. If the Indian room is rented for 2 people, its cost is reduced by 10%, for the first room - by 20%, for 4 - increases by 10%. Description of the room: Russian room - 2-3-bed room with private facilities, located on the 2nd floor of the lower guest house. The room is furnished with a wall cupboard, chest of drawers, bedside tables, a table, a 2-bedroom sofa and two single beds. If the Russian room is rented for 2 people, its cost is reduced by 10%, for a single person - by 20%, for 4 - increases by 10%. Description of the room: The Celtic room is a 2-3-bed room with private facilities, located on the 2nd floor of the upper guest house. The room has its own balcony with a table, the window is facing towards the mountains. The room is furnished with a wardrobe, chest of drawers, wall shelves, a table, a 2-bedroom sofa and two folding chairs. If the Celtic room is rented for 2 people, its cost is reduced by 10%, for a single person - by 20%, for 4 - increases by 10%. 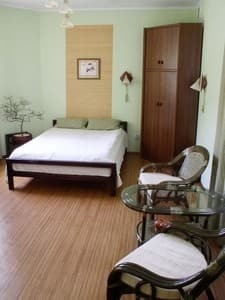 Description of the room: The Chinese house is a cozy 2-room cottage designed for rest of a small family (up to 4 people). A special oriental flavor is given to the interior by paintings, vases and other "trifles" in the decoration of its rooms. 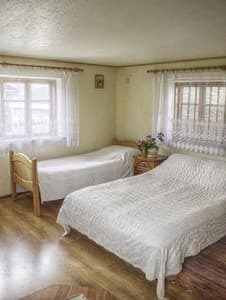 The rooms in the house are adjacent and furnished with a wardrobe, bedside tables, chest of drawers, armchairs and a table, a double bed in one room and 2 single beds in the other. In the hallway there is a locker for shoes and a hanger for outer clothing. If the Chinese house is rented for 3 people, its cost is reduced by 10%, for 2 people - by 20%, for the first - by 30%. Children under 5 years old stay free of charge without providing extra bed. The cost of living for children under 14 years without a separate seat is 50% of the established for additional residents. 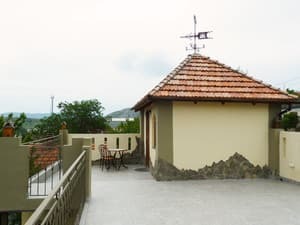 The hotel is located in the eastern part of Sudak, on the slope of Mount Fireynaya, a 15-minute walk from the waterfront and water park. By plane to Simferopol, and from the airport - by taxi to the hotel (about an hour and a half drive). By train to Simferopol, or Feodosia. From the station square of Simferopol to Sudak there are bus services every 15-30 minutes (approximately 2 hours drive). From the Sudak bus station you can take a taxi (about 5 minutes drive).